What makes the church what it is? 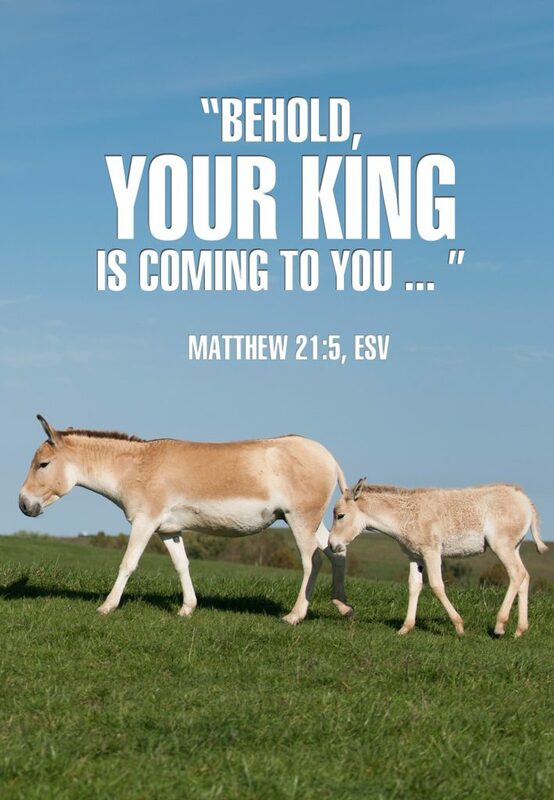 According to Luke 19:28–40, at the heart of what the church’s origin is King whose steed in his triumphal entry is a donkey. You are the church of the donkey-riding King! Your King is coming! Your King comes riding a donkey. The great journey to Jerusalem began in Luke 9:51. Now Jesus enters the city as King. He claims kingly authority. Requisitioning the colt which had never been ridden expressed that authority. The young donkey was an animal of peace (that is part of the point of the prophecy in Zechariah 9), but don’t despise the steed. Newly anointed King Solomon had entered the same city on his father, David’s mule. The disciples recognize the royal claim as they lay their outer garments on the colt for a saddle and spread their cloaks for a carpet to pave the royal way. Jesus accepts this treatment, as well as the adulation of the crowd of disciples. “He knew that the time had come when He was to die for sinners on the cross. His work as the great Prophet, so far as His earthly ministry was concerned, was almost finished and completed. His work as the sacrifice for sin and substitute for sinners, remained to be accomplished. Before giving Himself up as a sacrifice, He desired to draw the attention of the whole Jewish nation to Himself. The Lamb of God was about to be slain. The great sin-offering was about to be killed. It was meet that the eyes of all Israel should be fixed on Him.” (J. C. Ryle, Expository Thoughts on the Gospels: Luke, pages 309–310). Jesus is showing you, not only that he is King, but also what kind of King he is. He knows all things. Before reaching the next village he pauses, sends two disciples ahead, and tells them to bring the colt to him. He knows that they will be questioned. He instructs them how to reply. He knows that the colt will be given for his use. Luke is describing your King who knows all the details of your life. That is profoundly comforting as you face a world that seems to be increasingly uncertain. Are you worried about your job? Your health? Your future? Your King knows all the details of your life, and he is active in your behalf. King Jesus initiates this event. Earlier Jesus had avoided crowds (Luke 5:14-16) and had forbidden people to speak about him (Luke 8:56). Now he is encouraging the crowd. In the preceding context he had spoken about the kingdom, correcting a mistaken notion of its immediacy, but emphasizing his kingship. He sends for the donkey, and the public requisition of the animal draws attention, not just to Jesus as a person, but to his authority as well. Jesus is forcing the hand and the timetable of the leaders of Israel, who desire his death, but not during the Passover, while the city was full of pilgrims. Not only is Jesus claiming to be King, but he is forcing the hand of his enemies. The King forces you to chose whether to submit and trust in him or to oppose him. The Pharisees object to the cries of royal welcome and ask Jesus to silence his disciples. But Jesus responds that if the people were to be silent, the very stones would cry out. Think of the piles of stones in Judges, stones that stood as silent witnesses to Israel, calling them to faithfulness, and reminding them of their God. Now, in the presence of the King, if need be, if there are no other cries of praise, the stones will sound the praise of their maker. And they will shortly utter their voice when the shouts have changed to “Crucify,” then the earth will quake. “Whether men praise Christ or no he will, and shall, and must be praised (v. 40): If these should hold their peace, and not speak the praises of the Messiah’s kingdom, the stones would immediately cry out, rather than that Christ should not be praised. This was, in effect, literally fulfilled, when, upon men’s reviling Christ upon the cross, instead of praising him, and his own disciples’ sinking into a profound silence, the earth did quake and the rocks rent.” (Matthew Henry, Commentary on the Whole Bible, at Matthew 19:40). Bless Jesus as your King. Luke’s Gospel confronts you with your King. The King who entered the city on an unused donkey would, within the week be placed in an unused tomb. But from that he would rise again. Luke writes so that you recognize the King as your Lord. Join in blessing the King. Borrow the words of the crowd–they are fine words, as far as they go–but understand what they really mean. Remember the sacrificial death of your king. Focus on the glory of his resurrection. Don’t only cry blessings to your king–live as those who belong to him because he has triumphed and purchased you for himself. You cannot go back in history and join the crowd that day. But you, as you trust in him, can and will join in blessing your King. Revelation 7:9-12 gives you another picture of this King, picking up the royal imagery of Psalm 118 and of the Triumphal Entry. You are part of that uncountable host. Recognize your King and, from the bottom of your heart and with all your life, bless and serve him. I serve as pastor of Trinity Presbyterian Church, Newberg, Oregon. This entry was posted in Reflections. Bookmark the permalink. In the name of the Father, the Son, and the Holy Spirit, we welcome you to our fellowship.